The City Council OKs the latest round in an epic battle to build a 150-foot office in West Central. A long-disputed high-rise office tower near the Spokane County Courthouse won approval from the City Council last week — a decision that was overlooked on an evening dominated by fireworks over increasing the powers of the police ombudsman. The council voted 5-2, with Richard Rush and Jon Snyder opposed, to approve the 15-story project known as the DeWood Tower, in a sort of Plan B design. 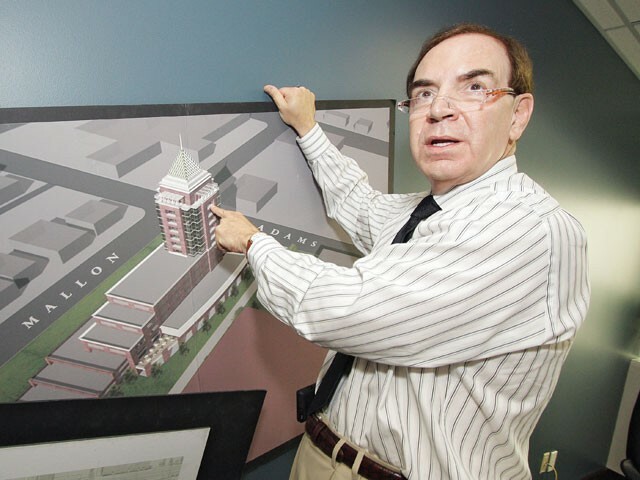 The original tower design pitched by developer and former heart surgeon Dr. Marcus DeWood included a mix of office and retail space, but a Superior Court judge had previously tossed the retail component as inconsistent with city land-use regulations. It’s been a long battle: DeWood’s Plan A, the office tower with retail and underground parking, is still alive in the court of appeals. A favorable ruling there could bring it back into play at the city level, DeWood says, or it could go to the state Supreme Court if someone else appeals. Brad Chinn, who lives adjacent to DeWood’s project, has fought the project at every turn, citing current zoning regulations on the property that cap building heights at 35 feet. The jump to 150 feet should not be allowed, Chinn argues, because it creates a more intensive use of the site than current regulations allow. A Superior Court ruling, however, has determined that office zones are office zones, regardless of height. City Councilwoman Amber Waldref says that, despite her misgivings about the project, the court ruling that consistent use trumps height swayed her to vote for approval. Councilman Richard Rush says he objects to the “willy-nilly” aspect of allowing tall towers outside of the identified “Centers and Corridors” locations in city planning guidelines. The dispute has been ugly at times. Chinn, a court commissioner, was among Mayor Mary Verner’s original three picks in the city’s first wave of judges for its newly created Municipal Court. Chinn was the most experienced of the Municipal Court candidates, but was removed by the City Council, which objected to his involvement in the land-use dispute. The Inlander was unable to contact Chinn. DeWood leveled charges that Chinn used court time and a court computer to fight the tower. Asked by the Spokesman-Review in late 2008 if he had any proof of his claim, DeWood said, “I don’t. But how do I know he isn’t?” Others have been critical of DeWood’s contributions to the campaigns of council members Nancy McLaughlin and Steve Corker, who represent the courthouse neighborhood, as well as DeWood’s involvement with the West Central Neighborhood Council. Donations from Monroe Court Limited Partnerships (DeWood) and W& K Investments (Walt Worthy, who partnered with DeWood in an earlier office building project) for $1,500 and $1,000, respectively, are two of McLaughlin’s largest campaign contributions last year. McLaughlin and Corker revealed the contributions before last week’s vote and declared the donations did not influence their decisions. Both voted to approve the plan. DeWood has contributed his own money to help the neighborhood council fund various programs over the years. The neighborhood council has voted overwhelmingly to support his project. Asked if he sees this as giving undue influence to developers like himself, DeWood says no.